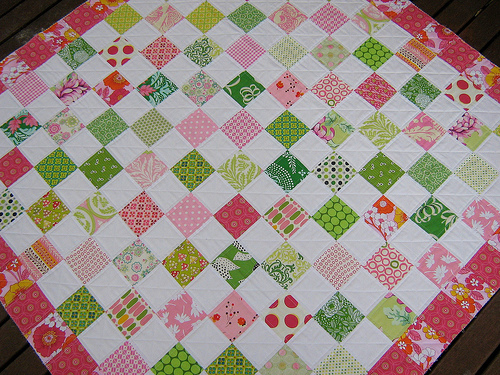 After a late night I have finished the quilting of the Pink and Green Squares quilt. The quilting went really well and I am very pleased with how it has added more interest and detail to the quilt. This picture was taken with the sun shining on it, and although the colors are not quite right, it does show the quilting design really well. I first outlined all the seams by stitching just a quarter of an inch inside each seam line. Rather than marking the quilt, this can be easily done by using the edge of your sewing machine foot as a guide, and adjusting the needle position so that the stitches are the required distance from the seam line. I decided to also cross hatch through all the white squares. This does require some minimal marking. I used a Clover Chaco marker for this and I prefer to use white. Although the white on white is barely visible it does the job. I prefer not to use colored chalk on white fabric as I find it can leave a colored mark on the white fabric as well as the stitching thread. I used 100% cotton Aurifil Mako thread again in 40/2 weight. I has a really nice sheen to it which fits in well with the overall "prettiness" of this quilt. The stitch length I used was 4 mm. 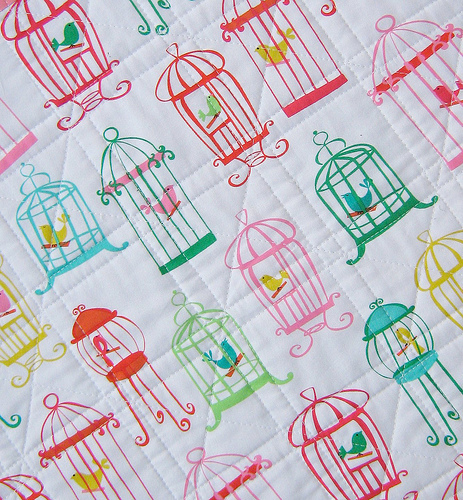 The birdcage fabric is terribly cute and is called Tweet Tweet by Michael Miller. This quilt is ready for its binding! The quilt looks great! I really like the outline quilting 1/4 inch from the seams, it's something I do very often because I like the result so much. The crosshatching is a very nice touch. 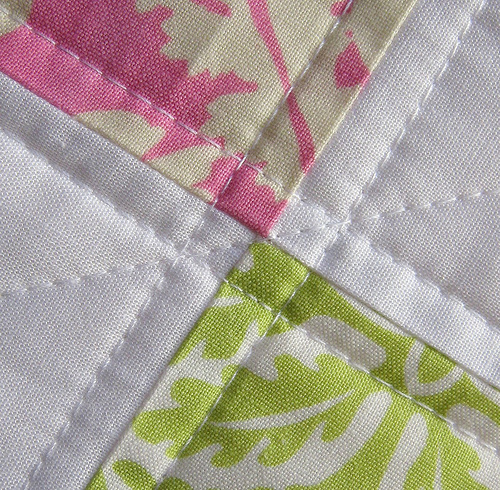 Love that pieced backing, too! Oh wow - it is looking absolutely stunning! I can't wait to give one a go myself - thanks for the inspiration. BEAUTIFUL!! I love seeing how you quilted this. Gives me ideas for how I can get one done that I want to do but I haven't had a chance to practice the free form stippling yet. This will work great! I love the quilting detail. Thank you for sharing the info on thread and so on. 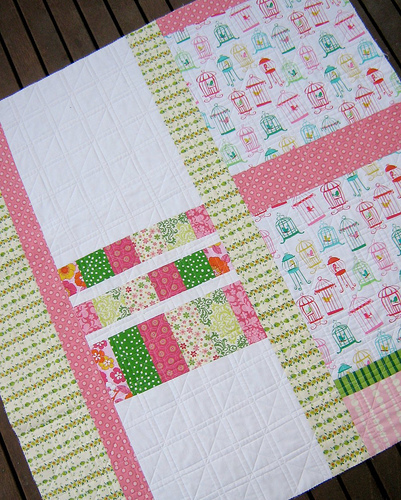 I love the teenie quilting squares at each corner and those tweet tweet bird cages are something else. Very impressive as usual. I like how you have given us your info. I will keep this in mind when I finally come around sewing a quilt. I love the quilting as well! 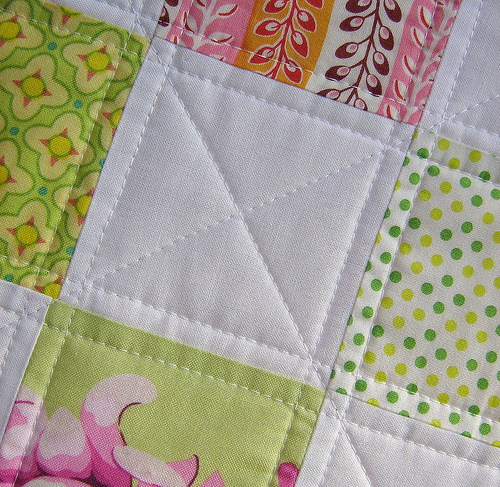 The diagonal quilting across the white is inspired, it just makes the quilt! And I've learnt something new for next time I straight quilt something (have to go out and buy some more batting - have 2 finished tops...), I'm going to use a longer stitch length - I never even thought about it, but makes sense... So thanks! The quilt is absolutely beautiful!! I just love the colors, perfect. And the quilting is perfect too! Tweet, Tweet is such a fun fabric and perfect for your beautiful backing. I think I said perfect 3 times, oops now 4. Love it! I like how you did this, my personal choice is that I do not like the swirly machine quilting but this goes with your design of your quilt and I really like it. that longer stitch length makes such a difference. It is beautiful....i have a quilt just dying to be quilted and this just might be what i was looking for. Another gorgeous creation. Love your colors and simplicity of the quilt. Your quilting design is perfect. I'm always on the look out for different quilting designs. I LOVE pieced backs. Such a lot of quilting but I love the effect. Your piecing and quilting look so precise! Another winner. Love the color, texture and awesome quilting. I really love how this quilt has turned out! I am really liking the straight line quilting you do. I really need to try it so I can get a quilt finished. Very pretty! The quilting detail is so nice on this - beautiful job!! love the quilting! i am so gonna try that way soon...i love the look it gives! beautiful quilting! I think I'll try it soon. Pink and Green? An awesome, fresh combination. Love it. As for the back...wow! I love that tweet tweet, I only have a bit of it though! That's one of my favorite ways to quilt, and yours looks fantastic. What a BEAUTIFUL quilt! I love the topstitching you did, particularly in the white - such a nice detailing. Thanks for the blog - your creativity is very inspiring, and I love seeing what you are making! I wish I had read this post a week ago. I love you you quilted this! I just finished a doll quilt that is all small squares and would have copied your quilting on this one if I had known! So pretty--the whole darn thing. Your quilts and quilting are spectacular! (As always)! I love Aurifil and piece with the 50 weight. Do you use the 40 weight just on quilting or on piecing and quilting both? Such a beautiful quilt. So glad I found your blog tonight. All your work is amazing.